Palazzo Manoel, also known as Casa Leoni, was built by Grand Master Vilhena in 1730. The palace has a small front garden having an ornamental central arched gateway with the coat-of-arms of Grand Master Vilhena and which is flanked by two double-height rooms, each having a pair of stone-carved lions clutching Vilhena’s coat-of-arms, hence known as Casa Leoni. The main façade consists of a central arched doorway at ground floor and an open balcony at first floor. This balcony is supported by three triple height corbels and a heavily moulded coat-of-arms is centrally placed above the balcony doorway. Both the doorway and balcony are flanked by a number of wooden louvered windows having moulded surrounds. A main feature of the interior is the staircase. The palace is complimented by a large garden at the back and its design is attributed to the French military engineer Francois de Mondion. Most of this garden was opened for the public in 1977 and named ‘Romeo Romano Gardens’. The extensive gardens are very well planned and characterised by grid-iron flagstoned walkways. In the 19th century a water lifting apparatus (sienja) was installed to water the gardens from huge underground rock-cut bell-shaped reservoirs. In 1798 Casa Leoni served as a command base for the Maltese insurgents against the French and later as a residence of British Governors. One of the halls contains the coat-of-arms of these governors. After the Second World War, the building was used as a depository of the Museums Department and as a Government Primary School till 1968. At present the palace befittingly serves as the Ministry for Education and Culture. 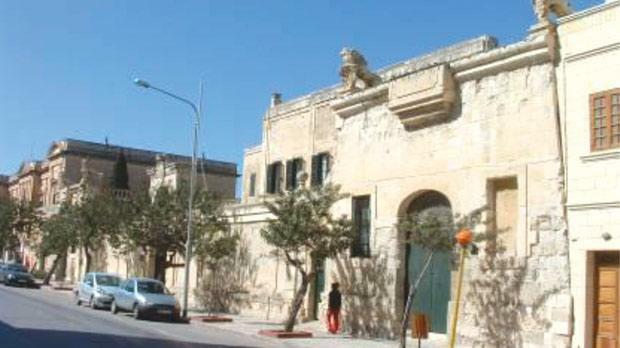 Palazzo Manoel/Casa Leoni at Santa Venera was included in the Antiquities Protection List of 1932 and was scheduled by MEPA as a Grade 1 national monument as Government Notice number 1082/09 in the Government Gazette dated December 22, 2009.